As in Alpine Select by Kevin Mclane, exit Trans Canada Highway 1 at Exit 119 onto Vedder Rd. Continue South for 5.5 km. Right before the bridge crossing, turn left onto Chilliwack River Rd (Chilliwack Lake Rd in Google Maps). Set the odometer to 0km here. Drive 30km and turn right onto Chilliwack South FSR past a campground. Google Maps says Nesakwatch Creek FSR is the one before, but that’s not the right turn. Cross a few bridges and take right onto Nesakwatch FSR. At 36.5km from the start of Chilliwack River Rd, there’s a fork. Take right here. When we went, there was a tape across the road so it was obvious which one to take. After a long uphill, there was another fork, take right here. There wasn’t a gate as described in Alpine Select so we parked our car right at the trailhead. We weren’t sure how far the trailhead was from the uphill so we cleared some rocks and fill in holes to drive up the hill. It took us 2 hours to get to the trail head. If you have a 2wd, you could park at the bottom of the long hill. It’s not too far from trailhead (maybe 1km). Approach trails here are well marked and maintained. I think it would be harder to get lost. Since there’s a creek (reliable source of water) by Slesse Memorial, we each carried 1 litter of water. We left the car at 2:45pm and arrived at Slesse Memorial at 3:45pm. 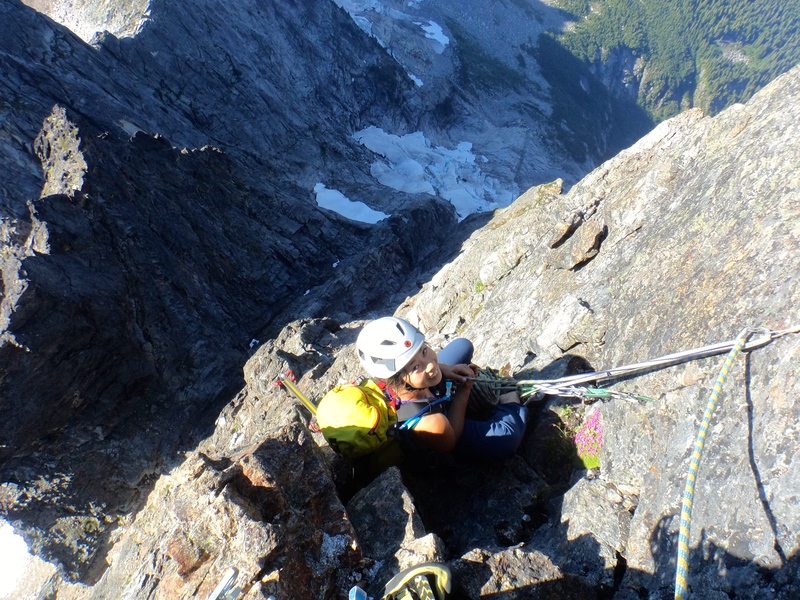 Alpine Select’s approach for North Rib is to drop down into the cirque, scramble up and bivouac before the glacier. 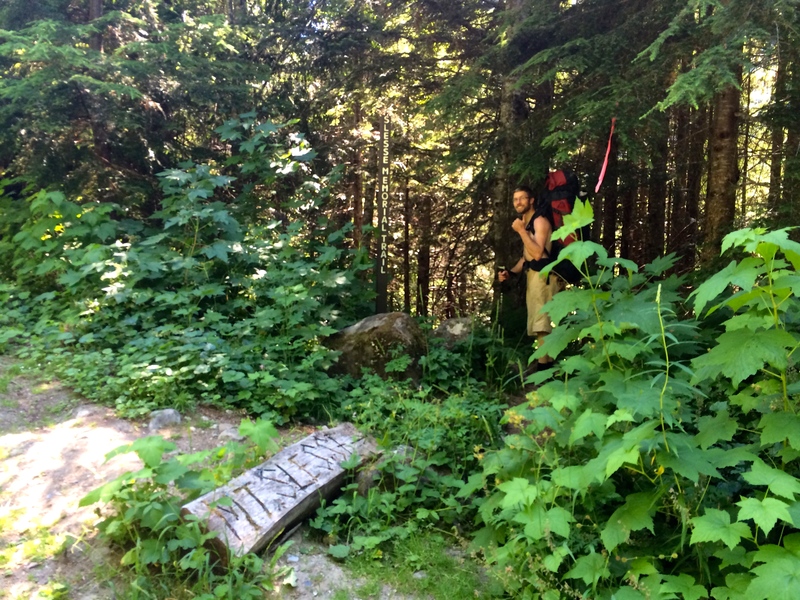 This route is far less traveled than other trails and would’ve been a bit of a bushwhack. 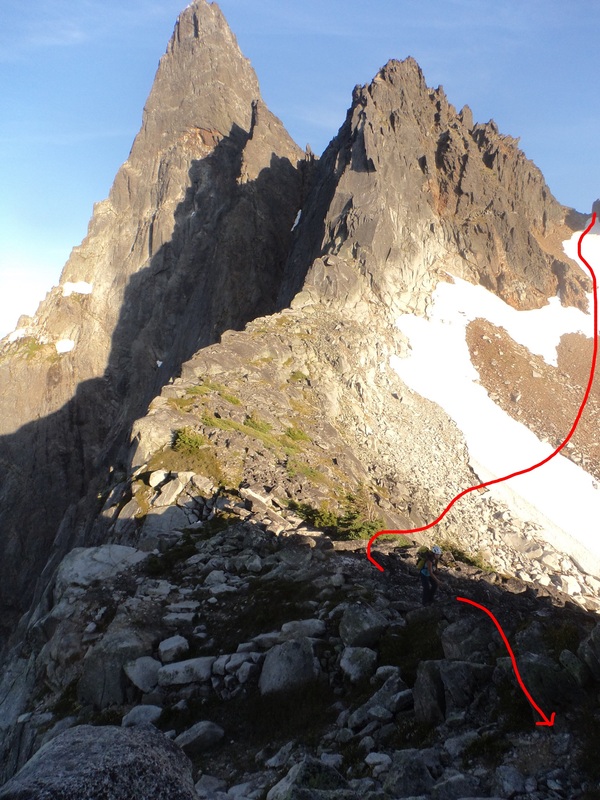 After spending some time on internet, we found out that it seems easy to traverse from Crossover Pass trail to the start of North Rib, and there seems to have some big boulders that we could set up a tent on. 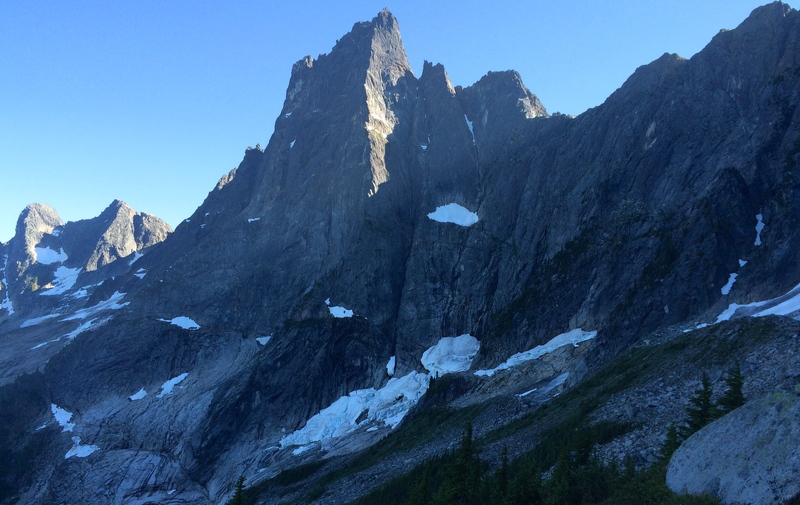 We decided to hike up the Crossover Pass trail and camp at where we branch off from Crossover Pass trail to traverse to North Rib. On the way in, we missed the turn for Crossover Pass trail. Crossover Pass trail is a bit before Slesse Memorial, so we hiked back, took the down hill trail to the creek and filled up our water bottles for the uphill. Sign for Crossover Pass. 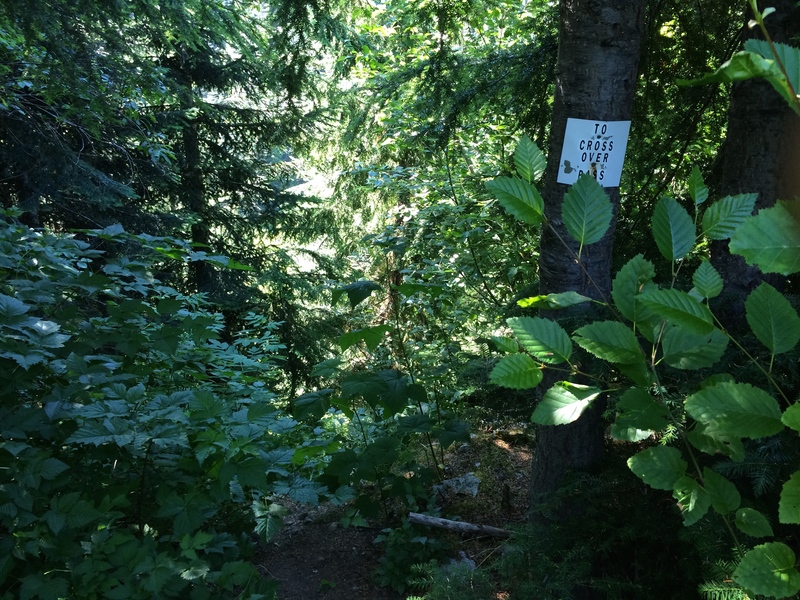 You have to hike about 5 meters from the main trail to see this sign. After the creek, trail gets really steep all the way to where we planed to camp. It took us 2 hours to hike up the steep hill with our heavy packs on. We found a flat boulder to set up a tent and also water source from snow by our camp. Throughout the day, we could hear glaciers breaking. We would have to cross North Slesse Glacier to get to North Rib, but we wren’t sure how stable the glacier would be. When I was setting up camp, I run into friends of mine (what a chance, in the mountain!) 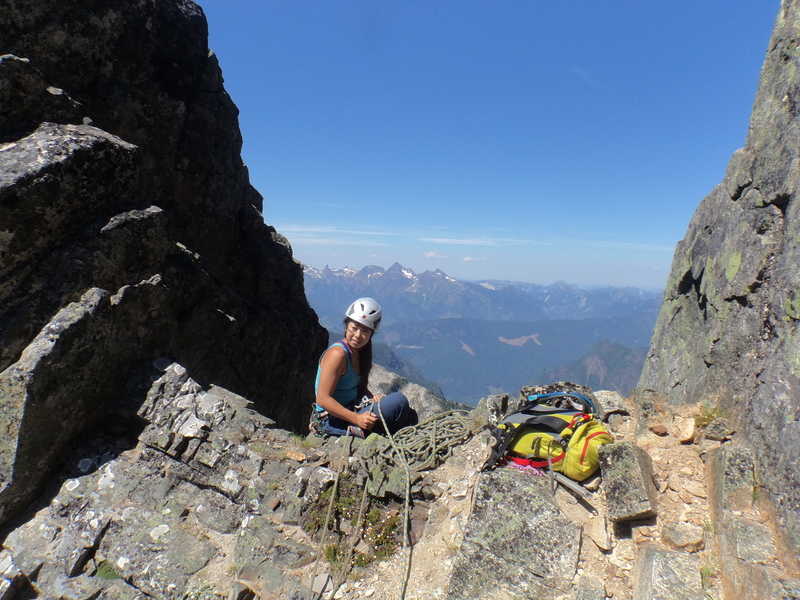 who just finished the Northeast Buttress and came down the Crossover Pass. They told us they saw movements on North Slesse Glacier once it was warmed up in the sun. 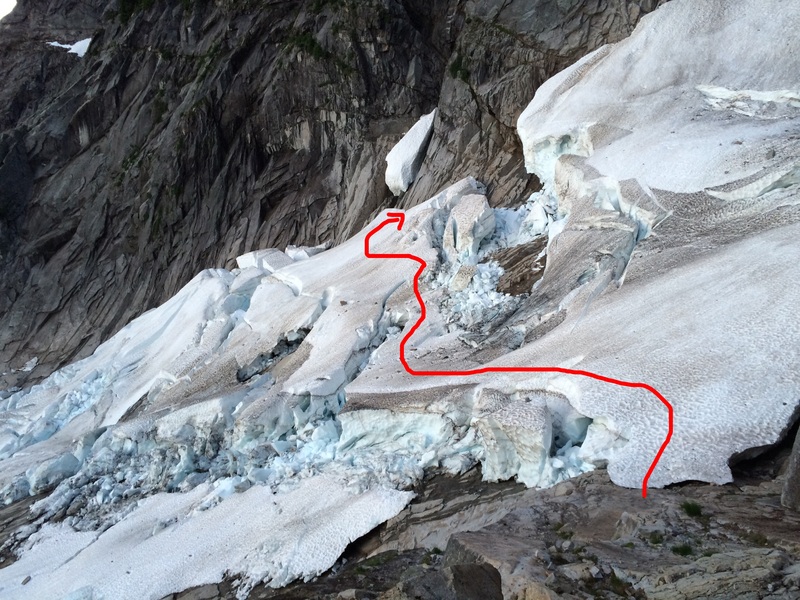 Since we camped up higher, changing the route was not an option, and there wasn’t much we could do to change the condition of glacier. We decided to do the best we could do; wake up early and get to the glacier before sun comes up. If the condition is bad, we won’t cross the glacier. We set an alarm for 3:30am and fell asleep. A loud rumble of glacier breaking woke us up at 3:27am instead of the alarm. We couldn’t see if it was the North Slesse Glacier or somewhere else, but it was enough to remind us about the condition of glaciers. We quickly got out of tent and boiled water for oatmeals. I didn’t feel like eating, but I knew I needed to eat and forced myself to finish all my oatmeal. 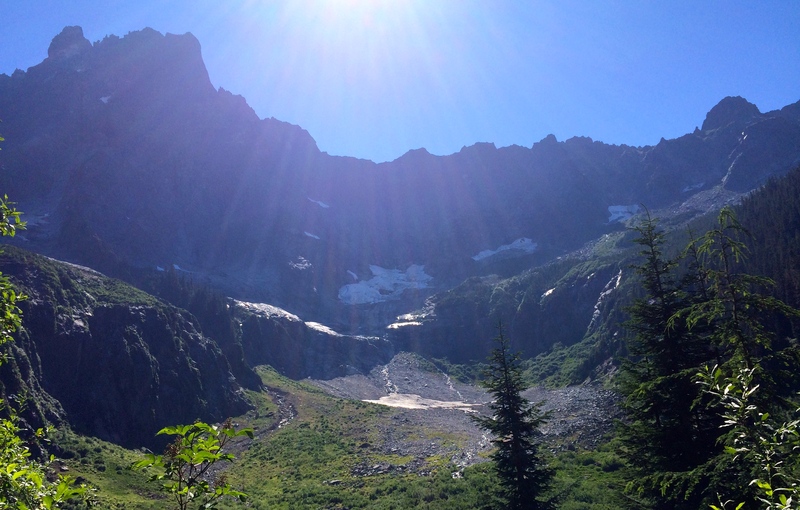 We left camp at 4:30am, headed over to North Slesse Glacier. Left camp at 4:30am. Moon was still up. We were at North Slesse Glacier at 5:00am. 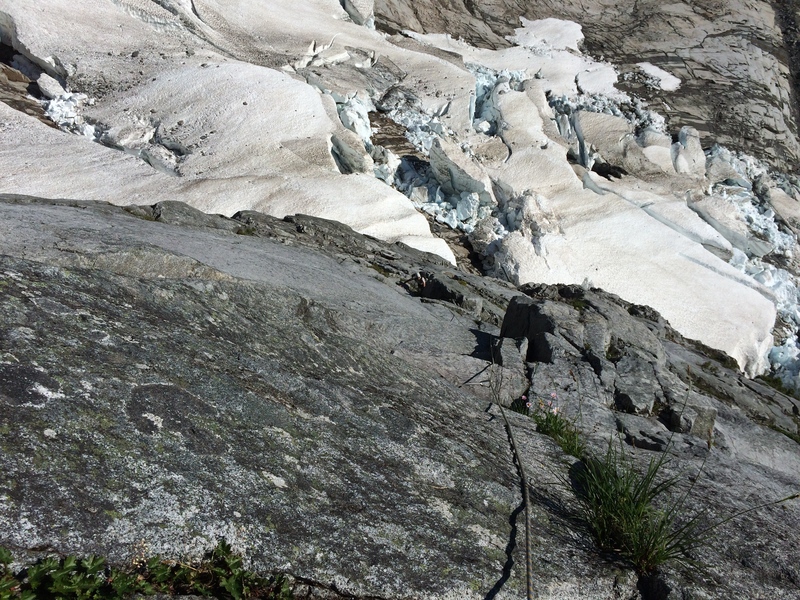 Condition of the glacier was not as bad as we thought it would be. 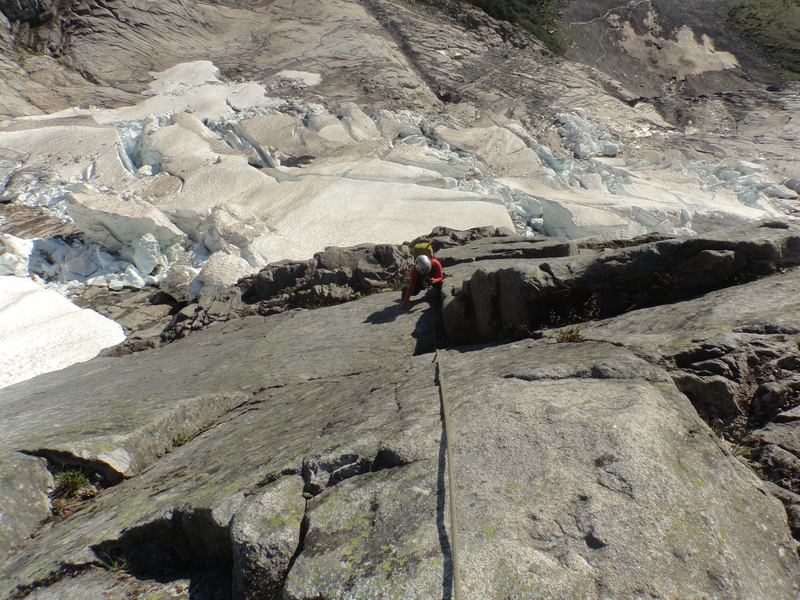 We assessed where we could travel on the glacier and we decided to cross it. Crossing the glacier was quick, and we were climbing by 5:30am. 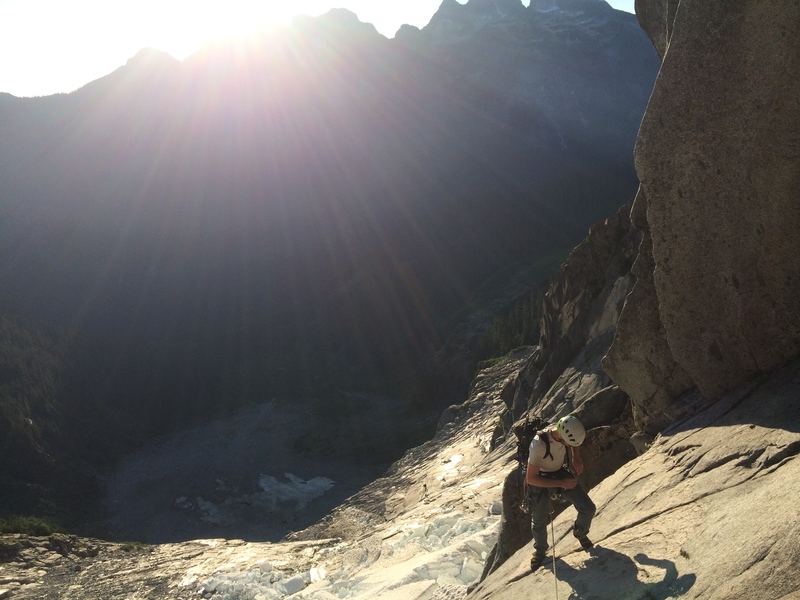 As I build an anchor and started to belay Nathan, sun came up and the glacier started to break again. I could see the edges of glacier breaking off and hear loud rumble as it tumble down on rock. I was glad we were both climbing, not on the glacier at that time. 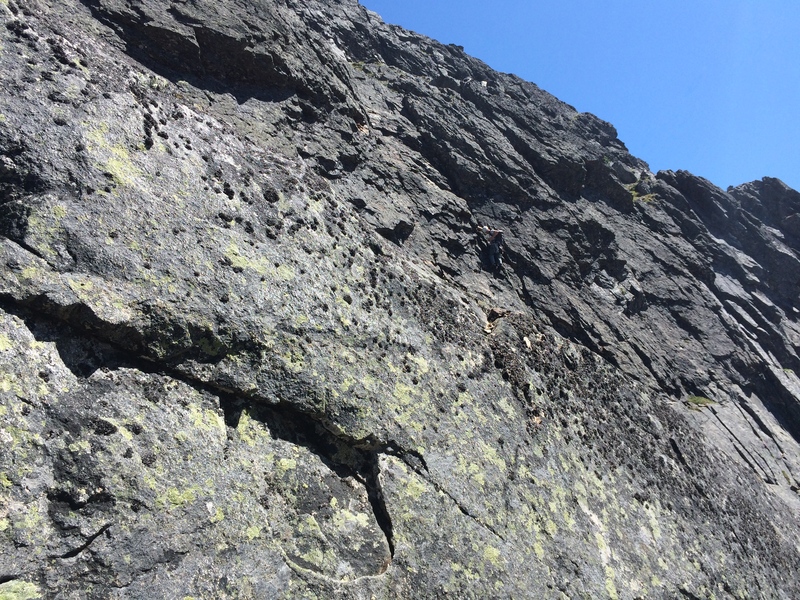 Pitch 1-6 was a bit runout 5.9 face climbs with some cracks. 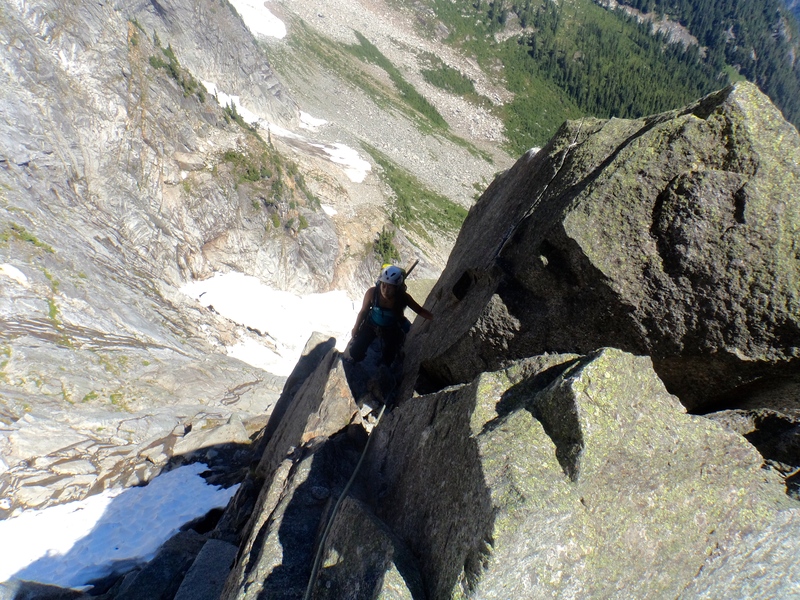 On Pitch 7, I traversed left on to a ledge and climbed on a few blocks. Then we turned right into the corner and climbed on the rib. After pitch 11, we ended up getting off route. It seemed too early for the 4th class that was mentioned in the book, but we simo-climbed the 4th class gully to the right anyways. 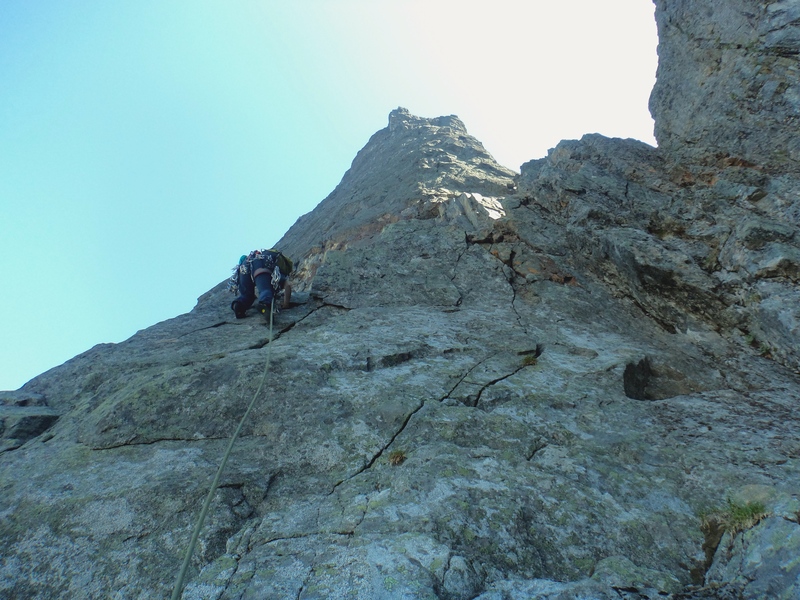 This pitch 12 turned out to be a long simo-climbing pitch. We should’ve stayed on the ridge, but it was too late when we realized it. 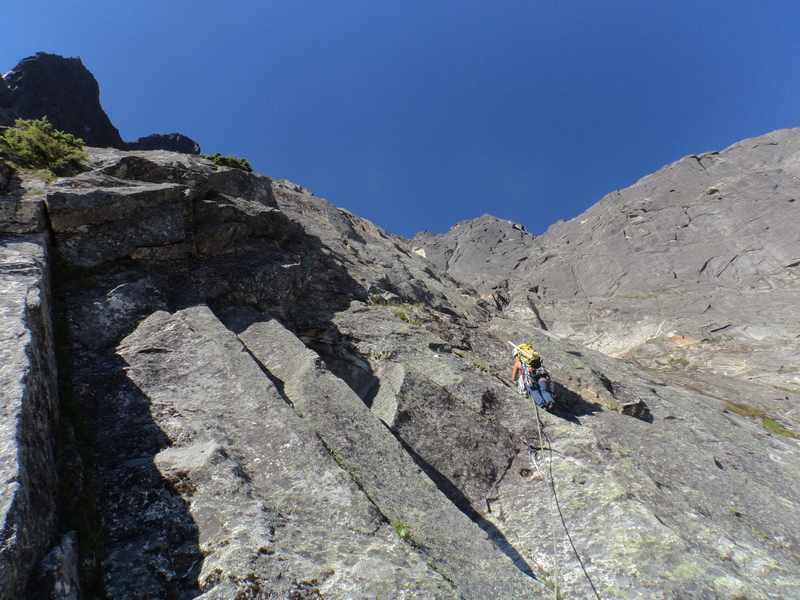 On pitch 13, we climbed back on to the ridge then did the 4th class to the notch. From the notch, we climbed on the summit tower. Granite on the summit tower was different from the rest of the route. It has more textures and have small knobs and jugs like sandstones. 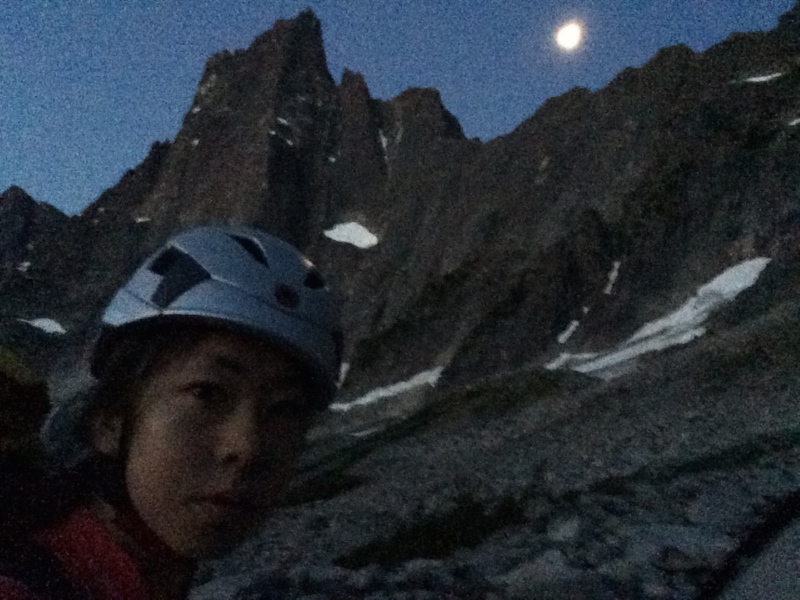 We did the summit tower in 4 pitches (3pitches and a short 10m pitch), and finally topped out after 12 hours of climbing at 5:45pm. 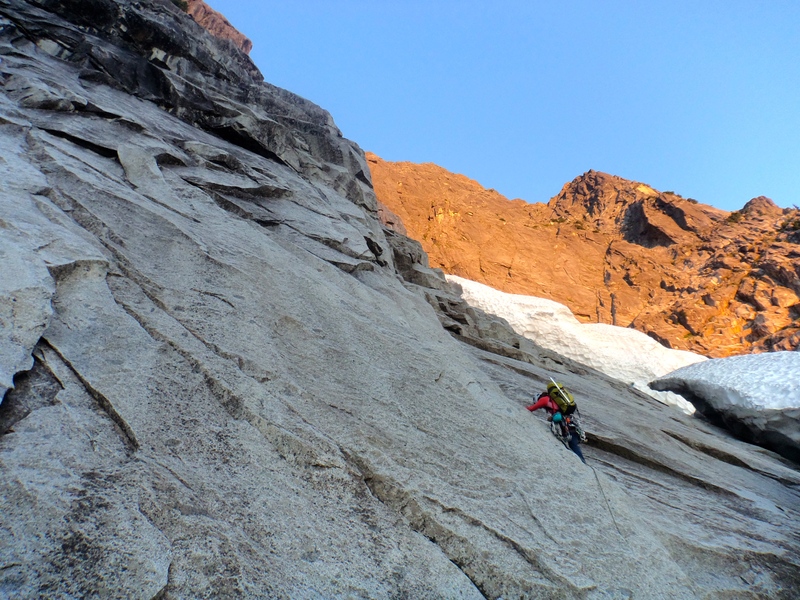 We climbed the route in 17 pitches including a long simo-climb pitch. 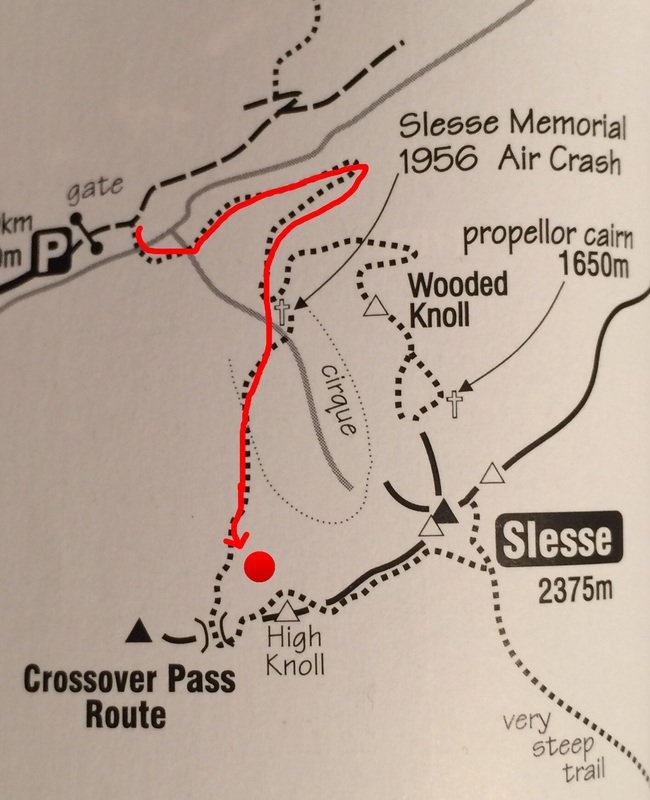 We took the Crossover Pass back to our camp for descent (Slesse Crossover Pass Descent by Jeremy Frimer is very helpful). The descent starts on the other side of summit, so we walked over to the other side, walked down a scree, then rappelled. 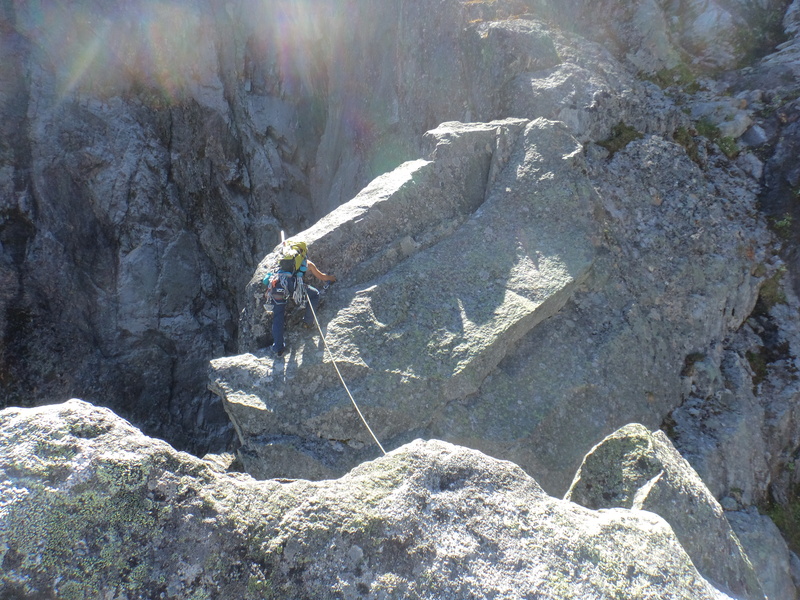 After a rappel, we walked down on scree again, there’s an anchor before the scree drops down much steeper. We did NOT use this anchor. 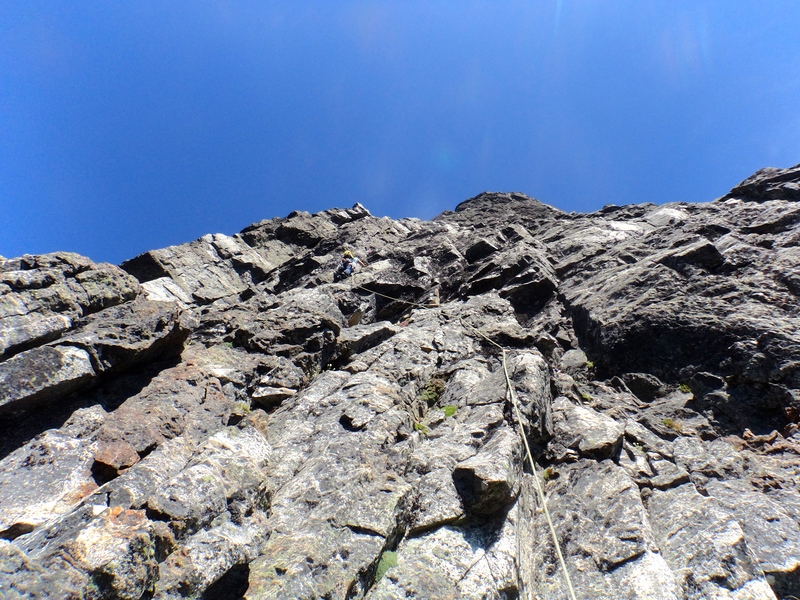 Instead, we traversed to climber’s left, and there was an easy down climbing. Down climbed instead of a rappel. 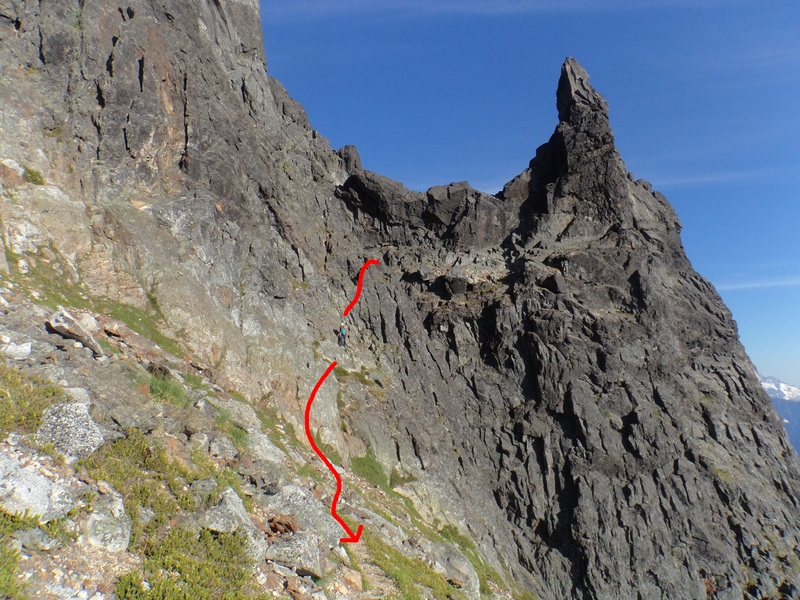 We hiked down on the obvious trail, did another rappel, and down climbed to the same gully as where the notch was before the summit tower. We followed the obvious trail again, but this time, we left the trail and hiked uphill to a small col through heather shrubs (this is the critical route finding 1 in Jeremy Frimer’s description). 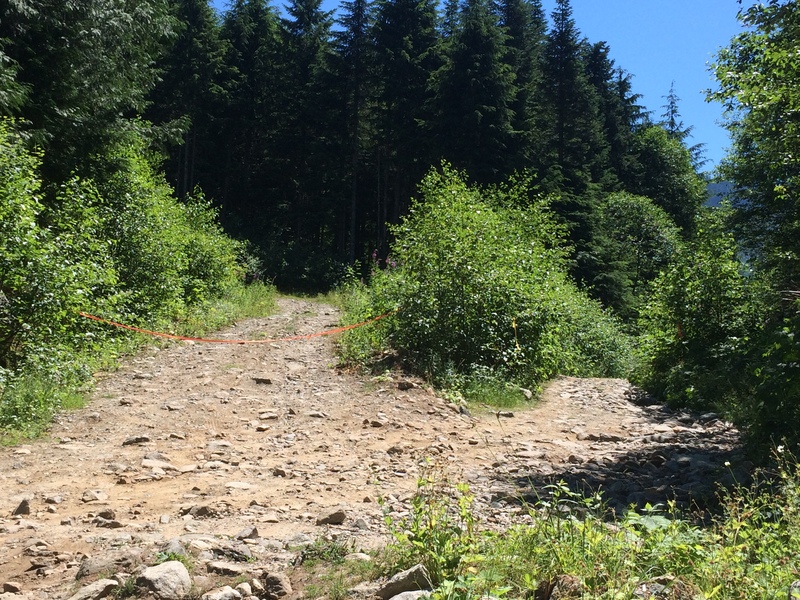 The obvious trail leads down to Chilliwack-Slesse FSR. 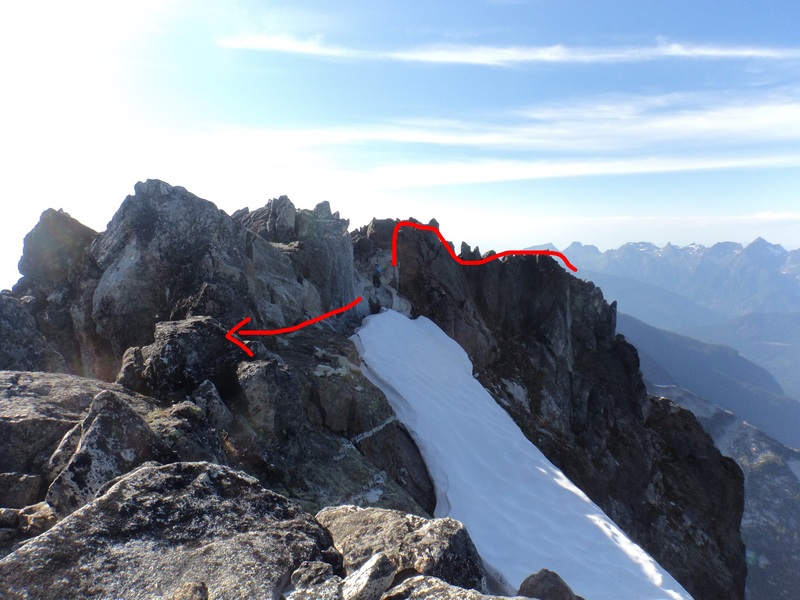 From here, hiked along the ridge until the “critical route finding 2.” Climbed up on the blocks, walked to the other end of the summit, and we found a rap anchor. We rapped down past the flat top of the gully to the next gully. We rapped off the end of 70m rope and down climbed a couple meters. Then we hiked down steep scree to the opposite side of our camp, hiked back up to the ridge, walked past Wooded Stump, and down climbed a bit to come back down to the orange scree that leads to our camp. We came back to camp at 9:45pm, just before it started to get dark. It had been more than 17 hours since we left the camp. We were so tired, made dinner quickly and snuggled into sleeping bags right away. The next day, we slept in until 9:00am. Woke up slowly, made breakfast and enjoyed being in the mountain. 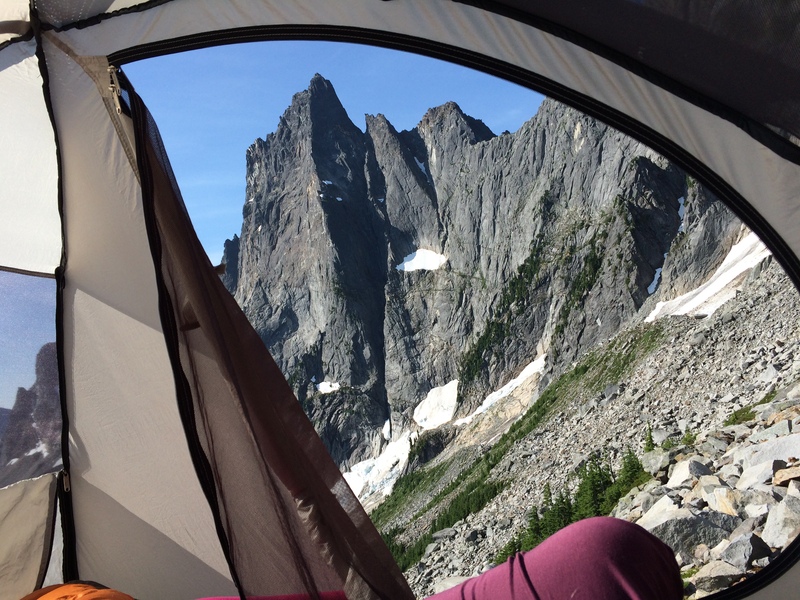 view from the tent, not bad at all! As we were eating breakfast, we run into a party coming down the Crossover Pass. 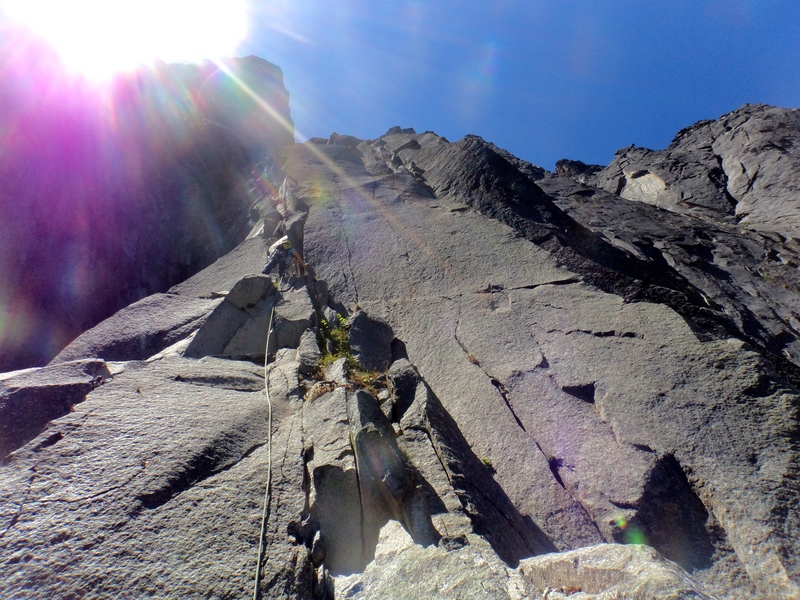 They were climbing the Northeast Buttress when we were on the North Rib. 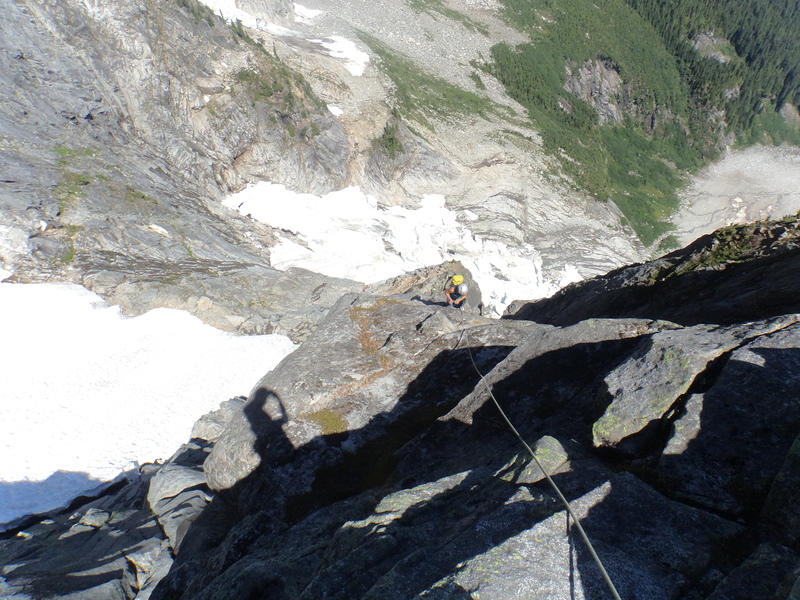 They said they bivyed on one of the ledges on Crossover Pass Descent. 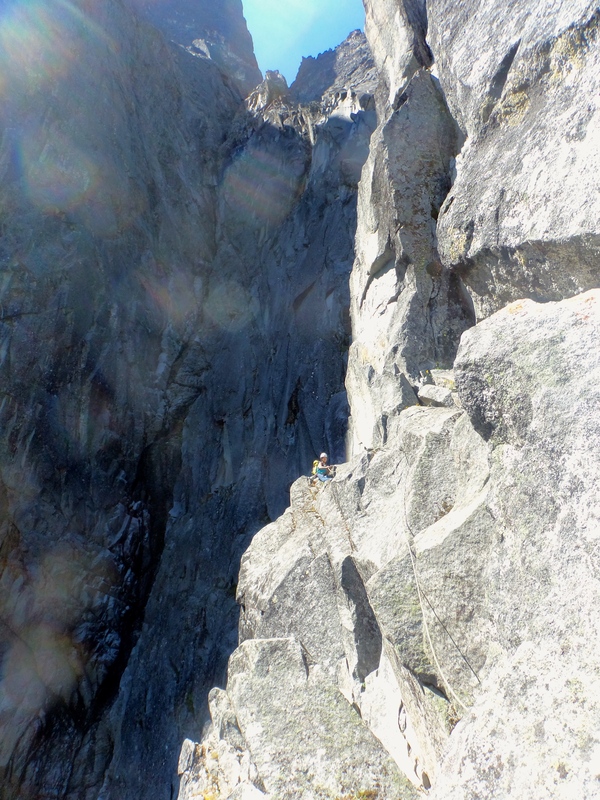 There was a party below them on the Northeast Buttress on that day. They said the party must have bivyed near summit. It was a warm night so it wasn’t a bad night for bivy. We packed up camp and started to head back at 10:45am. We were back at the car at 1:00pm and drove out of FSR at 1:40pm. I have been back in Squamish for a couple weeks now. 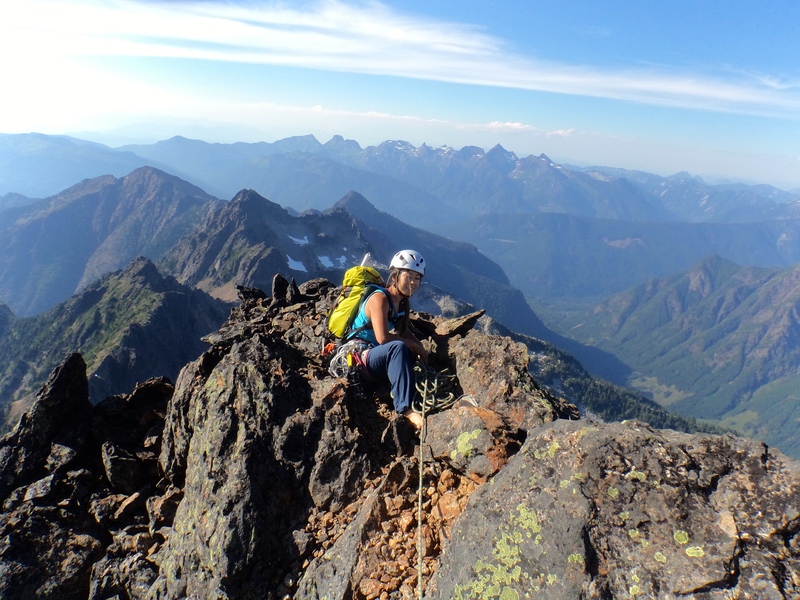 I had a few visitors, climbed at local crags and an easy alpine climb Life on Earth on Mount Habrich. 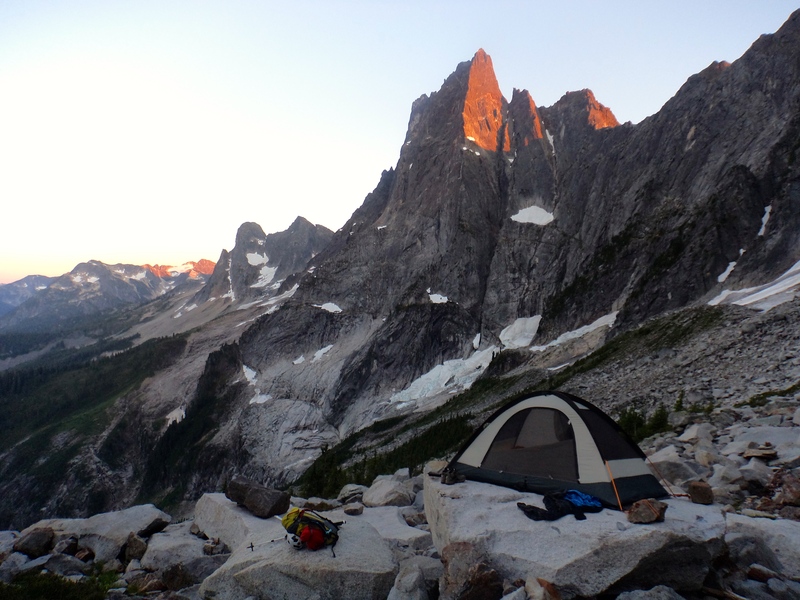 Today, as I’m finishing writing this trip report, I’m heading to Bugaboos for a month of alpine climbing…! Another banger trip report Yuki. Your approach beta and maps look like they would be very helpful for anyone following in your footsteps.